Other Common Names: Geater or common plantain, broadleaf plantain, rippleseed plantain, wagbread, white man’s foot, plantain majeur (French), groblad (Swedish), Wegerich (German), græðisúra (Icelandic), piharatamo (Finnish). 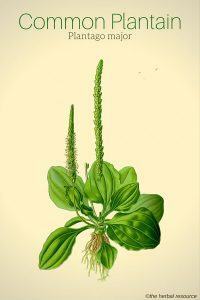 Habitat: Plantain is originally native to Europe and temperate parts of Asia. The plant has now become naturalized in all temperate regions of the world. Description: Plantain is a low growing perennial plant belonging to the Plantaginaceae or the plantain family. The oval or heart-shaped leaves are arranged in a rosette at the base level. The leaves have 3-9 elastic veins that are thick and dark green. The flowers sit in a narrow cylindrical stem, which is approximately the same length as the flower stalk. Each flower has yellowish brown petal lobes and purple anthers. The seeds have a very sticky surface, allowing them to be easily attached to humans and animals in order to spread. Plant Parts Used: It is the aerial parts of the plant that are used in herbal medicine. The leaves are picked throughout the flowering season and used fresh or dried. From the fresh leaves juice or extract can be obtained. The seeds have also their uses mainly as a laxative and food. Common plantains and ribwort plantain (Plantago lanceolata) have similar medicinal properties. Plantain contains iridoids (most importantly aucubin), flavonoids (apigenin), tannins, mucus, silicic acid, and enzymes. Aucubin increases kidney excretion of uric acid and apigenin is inflammatory. 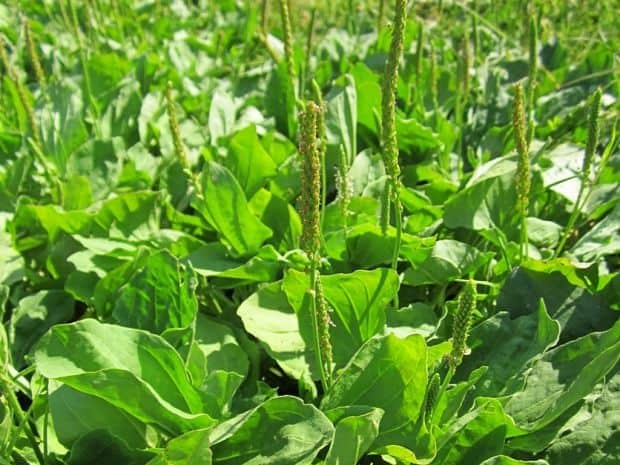 The plant has high nutritional value and is loaded with calcium, iron and vitamins A, C, and K.
Plantain was known to some of the ancient Greek and Roman physicians. The Greek Pedanius Dioscorides (40 BC-90BC) recommended plantain for wound healing, dog bites and burns, and Pliny the Roman (23 A.D.-79 A.D.) referred to the plant as an infallible remedy for bites caused by wild animals. Throughout the centuries the herb has had many medicinal applications and it was used as a remedy for a variety of ailments such as mouth inflammation, throat infections, earache, dropsy, asthma, and epilepsy. Plantain has gained the greatest reputation and is probably best known for its wound healing properties. The astringent, antibacterial and anti-inflammatory effect of the plant makes it helpful in treating minor wounds, cuts, and scrapes. It can be applied directly to damaged skin in order to halt bleeding, speed up healing, stop itching and alleviate pain. It is considered useful in treating snake and insects bites and stinging nettle rash. In addition, the herb has been used to treat eczema, psoriasis and first degree burns. The traditional use of it as a wound healing herb has been scientifically confirmed. Studies [Journal of Ethnopharmacology – 2010] have shown that it does contain chemical substances that disinfect injuries, kill pathogenic organisms, reduce inflammation and accelerate the healing process. In these studies, it was demonstrated that the fresh plantain leaf is the most effective. Plantain is considered helpful as a treatment for diarrhea, gastritis, colitis and other digestive ailments due to its astringent properties. The herb has been used to restore acid balance, to regulate gastric secretions and treat inflammation or irritations in the stomach and bowels. It has been used as a remedy for stomach and bowel infections, as well as urinary tract infections and because the herb has antispasmodic and demulcent effect it can be used to soothe irritation and reduce spasm in relation to colic in infants and young children. The seeds can be put to good use as a bulk laxative. Plantain reduces mucus secretion in the airways, which makes it helpful in treating colds, catarrh, sinusitis, lung and bronchial allergic conditions such as hay fever and asthma. As the herb also has antiseptic properties it can be used as a remedy for a sore throat, tonsillitis and coughs. The fresh young leaves are edible and can be used uncooked in salads. The adult leaves, because of the thick veins, are tough and stringy and not very suitable for using fresh but they can be boiled and eaten in the same manner as spinach. The seeds can be eaten either raw or cooked and can function in the same way as sago. As a tea: 1/4–1/2 teaspoon (1–3 grams) of the dried or fresh leaves in a cup of hot water steeped for 10 to 15 minutes. The recommended daily dosage is three cups per day. The fresh leaves can be applied directly, several times daily, to treat minor injuries, dermatitis, and insect stings and bites. It is also possible to prepare a medicinal oil as a cough medicine by using equal parts of finely chopped leaves soaked in cold-pressed sunflower oil. For all commercial preparations containing the herb, the manufacturer’s instructions should always be followed. 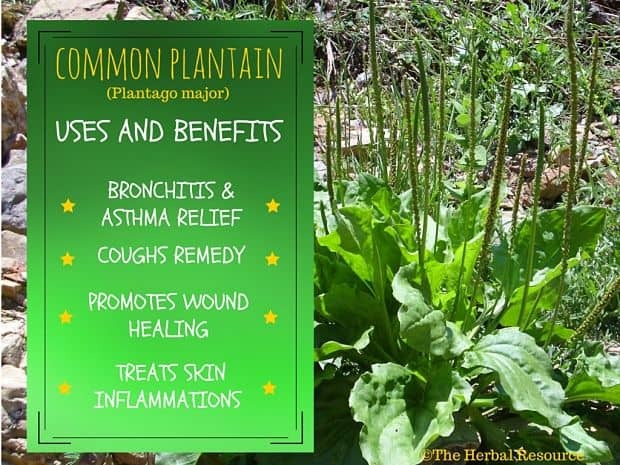 Plantain is considered a very safe herb to use, both externally and internally. Until research confirms that the herb is not harmful in any way, it is recommended that pregnant and breastfeeding women avoid using it. I had a broken molar that was infected and I was in great pain. We lived in northern Michigan remote area miles away from any town or doctors. There were 3 feet deep snow, and impossible to get to any clinic, a doctor, or a pharmacy. We were ‘grounded’ in our house. I was suffering and decided to be my own doctor. I took a flashlight and a shovel and went outside to the north side of the house, and moved the snow away until I reached the ground. Moving the snow about 2-3 square feet, I located one bush of shriveled plantain. I dug it up, washed it really well, and applied one leaf over the broken infected molar and the gums. Within 5-10 minutes, the pain lessened, and in less than 30 minutes, the pain was gone. I changed the leaf twice over the night. The next day, the county snow plow cleared the road, and I made it to the dentist, who treated my molar. He asked me what did I use to cure my pain? I had one leaf left in my shirt pocket and gave it to him. He was flabbergasted, has never heard about the plantain medicinal uses, and he was 30 years a dentist. Six months later, while shopping in the store, he recognized me and after we chatted for a while, he thanked me warmly. He said that ever since I told him about the plantain, he has been advocating and praising its uses to all his colleagues, friends. He used it even for treating his dog that was often sick. It always worked he said. I have used plantain for cuts, boils, internal, and external pain never had ANY bad side effects. We live in sunny Florida now, and to get fresh plantain, I use the flower pots and keep the pots in the shade making sure that I water and use composted fertilizer. One can grow plantain in southern states also.